Team 360 provides and the benefit to the greater community. For media inquiries please contact info@360tcpr.com. 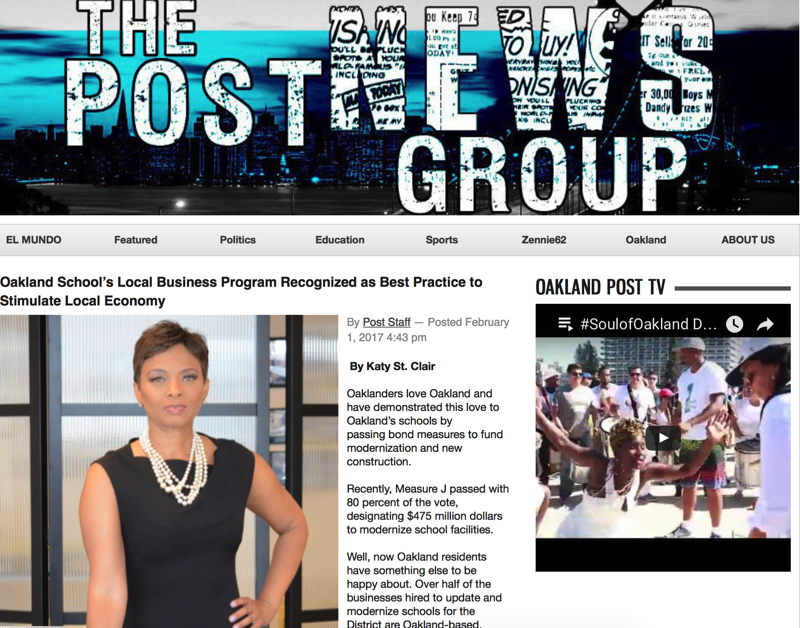 Shonda Scott is the creator and CEO of 360 Total Concepts, a management and marketing company headquartered in the Bay Area, providing businesses with program management in communications, contract compliance, logistics and general support. Scott has been successful in providing public relations and management assistance to school districts, television stations, and public officials from New Jersey to California, and has offices in Oakland, Los Angeles and Washington DC. Oaklanders love Oakland and have demonstrated this love to Oakland’s schools by passing bond measures to fund modernization and new construction. Recently, Measure J passed with 80 percent of the vote, designating $475 million dollars to modernize school facilities. Well, now Oakland residents have something else to be happy about. Over half of the businesses hired to update and modernize schools for the District are Oakland-based. The district put “Oakland first” and adopted a “local business utilization” plan in order to maximize community involvement and growth. So far, the results have been good news for schools, small businesses, and the local economy. Click here to read more. 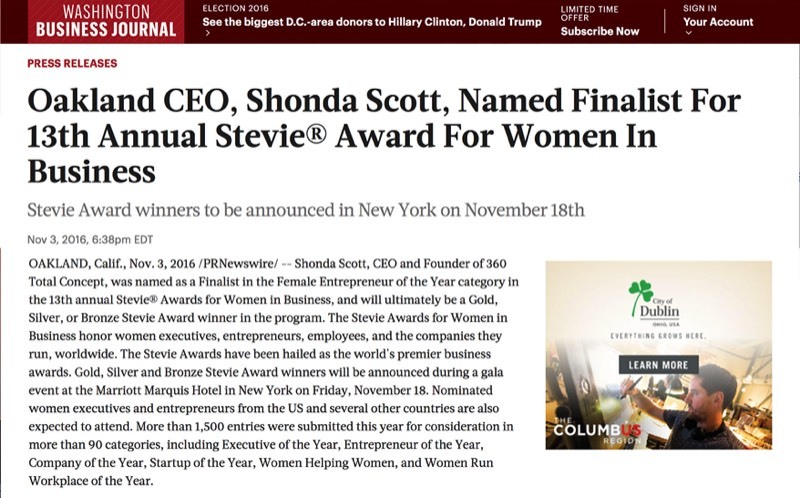 OAKLAND, Calif., Nov. 3, 2016 /PRNewswire/ -- Shonda Scott, CEO and Founder of 360 Total Concept, was named as a Finalist in the Female Entrepreneur of the Year category in the 13th annual Stevie® Awards for Women in Business, and will ultimately be a Gold, Silver, or Bronze Stevie Award winner in the program. Click here to read more. 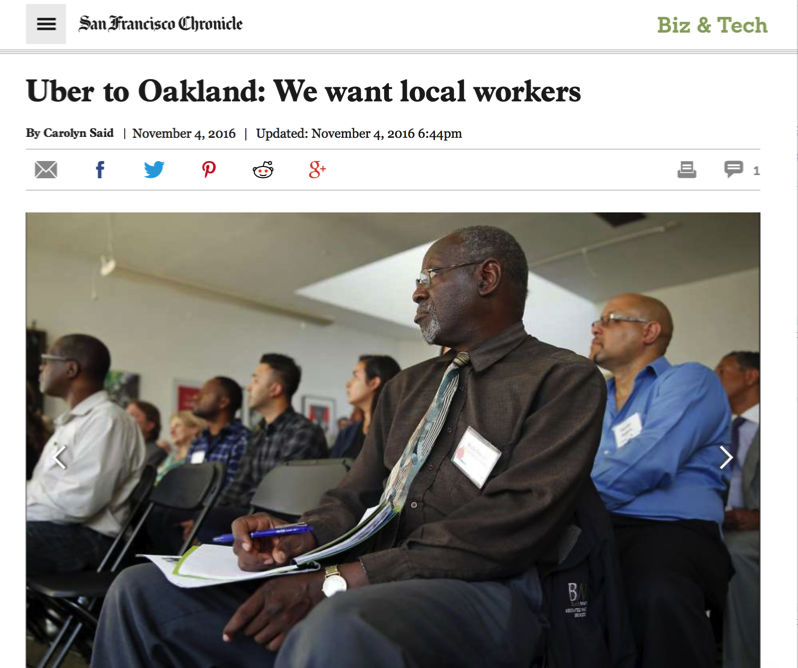 Uber has a message for Oakland: It wants to be a good neighbor. The ride-hailing company is 18 months away from moving into its East Bay headquarters in Oakland’s Uptown neighborhood, but it is reaching out to locals about jobs and business opportunities at the site. Click here to read more. Uber Technologies is teaming with an Oakland-based firm, 360 Total Concept, to host local business outreach events to maximize Oakland business participation as the ride-sharing company prepares to expand its headquarters to Oakland. Click here to read more. 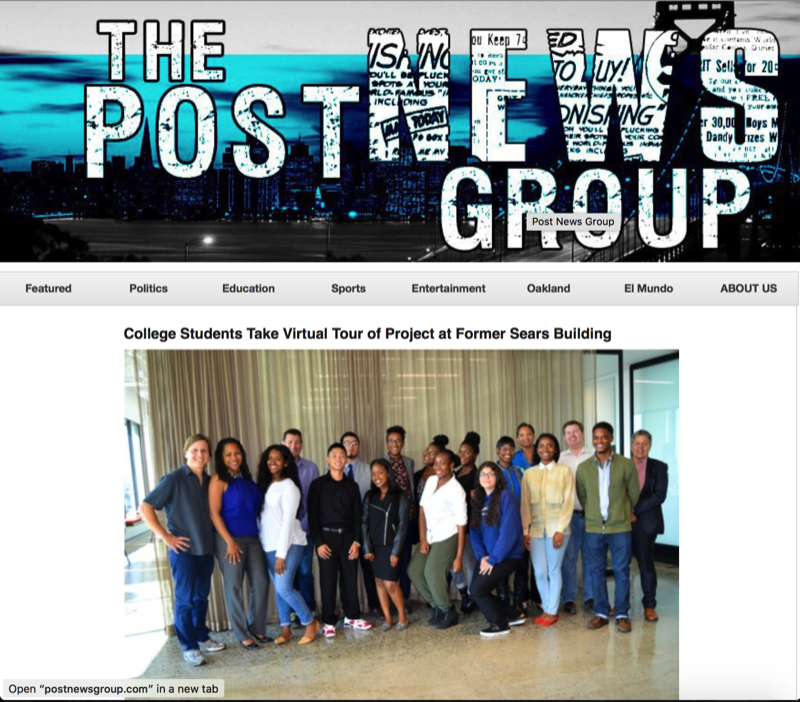 A group of college interns from Oakland recently took a virtual tour of a local construction project at the former Sears building and explored career possibilities in STEM fields with Oakland Council President Lynette Gibson McElhaney and the Construction Industry Workforce Initiative (CIWI). Click here to read more.